Welcome to Lyons Family Pharmacy’s online store - Onlinepharmacydirect! We are a one-stop shop for health, beauty and pharmacy products. With everything from fragrance to first aid, make up to medicines, skin care to sunscreen, Online pharmacy direct brings your local pharmacy to you. You will notice our prices are very competitive and we promise to always keep it this way! We are an independent family run pharmacy, delving into the world of online retail, we are more focused on quality goods and services than quantity, more than likely you will have come across us from our social media and we hope that you feel like you have stumbled across a hidden gem! We are adding new products every day, and if you can’t find what you are looking for call us on 025 51633 to see if we can help, we will do our best to add it to our online inventory . Call into the store in Fermoy, your medical needs will be looked after in a prompt professional fashion. They are readily available over the phone (on 025 51633) if you have any medical related queries. 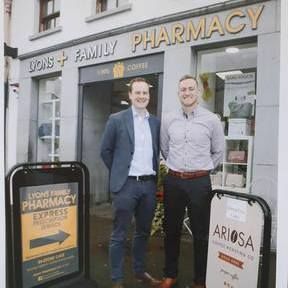 Lyons Family Pharmacy, 43 McCurtain Street, Fermoy, Co Cork.